We actually played Paperback before we played Tim Flowers‘ other game, Burgle Bros. At first we weren’t going to do a Paperback board game review since it was designed to be a competitive game, but the co-op mode is complete enough (and a fan favorite) so we ended up deciding to do a whole review on it here. 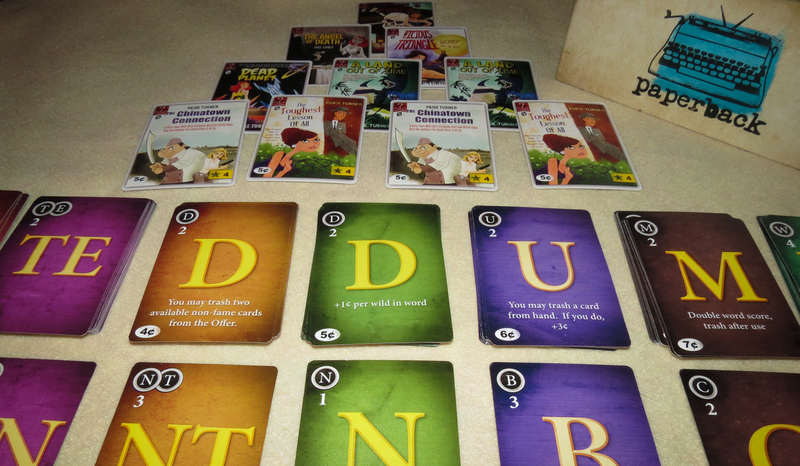 Paperback is a deck building game in which you are trying to finish a novel by turning the letters you have into words. In cooperative mode, you will be working with your teammates to buy all of the wild cards as you work through a pyramid of cards. In all Paperback modes, everyone’s deck starts out with five wild cards and the same five vowels. There will also be a Common deck consisting of four cards, one of which you can use as part of your words. The board is made up of the Offer, which consists of groups of cards of different values that you can buy during the game. You can buy cards from the Offer by combining the values of the cards you used to make words. These more valuable cards will help you to buy even better cards in the future. In co-op mode, you will also set up a pyramid of wild cards, with the values of each being higher as you work up the pyramid. Every time you don’t buy one of these wild cards, you will add a cube to one of the exposed cards. If you have to add a fifth cube to any wild card, your whole team loses. The strategy in cooperative mode is deciding when to buy from the Offer and when you should buy wild cards from the pyramid. You don’t want too many cubes on the pyramid, but you also need better cards to be able to buy the more expensive wild cards. You can’t combine your cards with your teammates’ cards in co-op mode, but you can help them figure out how to make words out of their cards. If you and your team of authors can take down the entire pyramid, then you all win! If you want to learn more about all of the modes in this game, check out the official Paperback rules. Paperback isn’t a very thematic game (especially in co-op mode), but – and you won’t hear me say this very often – that’s okay. This is a cooperative word game, so you will have enough fun trying to figure out how to turn your letters into words. If you’re new to deck building games or want to teach someone the mechanism, you can’t do much better than Paperback. Considering that deck building games usually take a while to learn, it’s quite impressive how quickly someone can learn the rules and start playing this one. As is the case with the other modes in this game, you can add in a bunch of included Paperback expansions before you start playing. For example, everyone in your group can have their own power card, which will give you all different abilities. These expansions add way more replay value to an already very good game. The only minor issue that you might run into is when people take a bit too long to come up with words to play. This issue isn’t as bad as it is in other word games, but it can potentially make players have to wait a while to take their turns. Of course, you can always offer some help when someone get stuck. 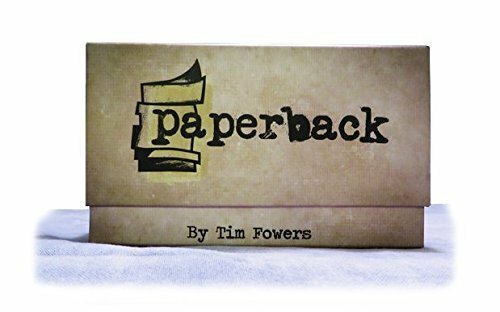 If you love word games and cooperative board games, then you’re probably going to be a big fan of Paperback. The cooperative mode isn’t just an extra variant; it is a full-fledged game that is a ton of fun to play. I’m not even a fan of most word games and I really like Paperback! There aren’t any other games like Paperback out there right now, so it’s one that will be staying on my shelf (and hitting the table) for a long time. You can test out the game by downloading the Paperback app for iOS or Android. Thanks for taking the time to read our Paperback review!